Our new, breakthrough serum was chosen by 7 out of 10 women over the current market leader*. Destined to become everyone's new favorite, our proven serum works immediately and over time to counteract environmental assaults and visible aging signs with a powerful combination of Idebenone and skin revitalizing technology. It works by helping support your skin's natural collagen and elastin for a firmer look. And, thanks to arazine - an exclusive new molecule -- it actually SOOTHES your skin while protecting against free radicals and reducing signs of aging caused by chronic inflammation. With continued use, it significantly reduces the visible appearance of age spots, wrinkles and even deep lines. 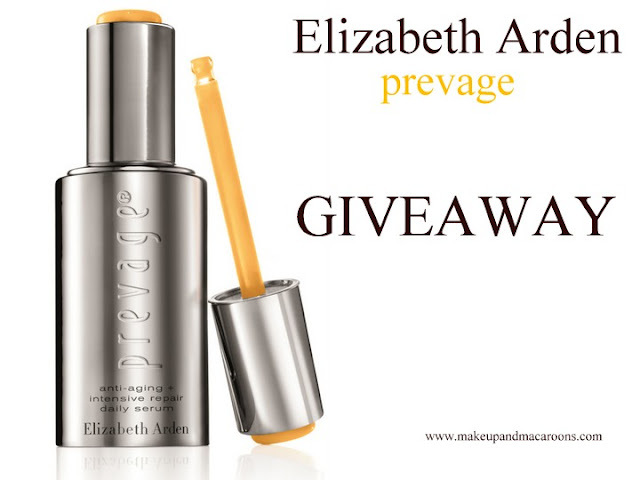 For optimal results, use as the first step of your PREVAGE® regimen day and night. 90% of women reported that it soothes and calms skin, while also improving skin's overall appearance**. *Based on a US home use consumer test on 237 women aged 25-65 over 2 weeks. † Based on a clinical study of 49 women. ** Based on a 12 week clinical study of 49 women by expert grading and subject self-assessment. To enter you must be a follower of Makeup and Macaroons via GFC, Bloglovin' or Facebook and fill out the form below. It's open to Australian residents only, and you must be over 18 to enter. The giveaway is open now and closes midnight 21 March 2013. Full terms and conditions are in the form below.